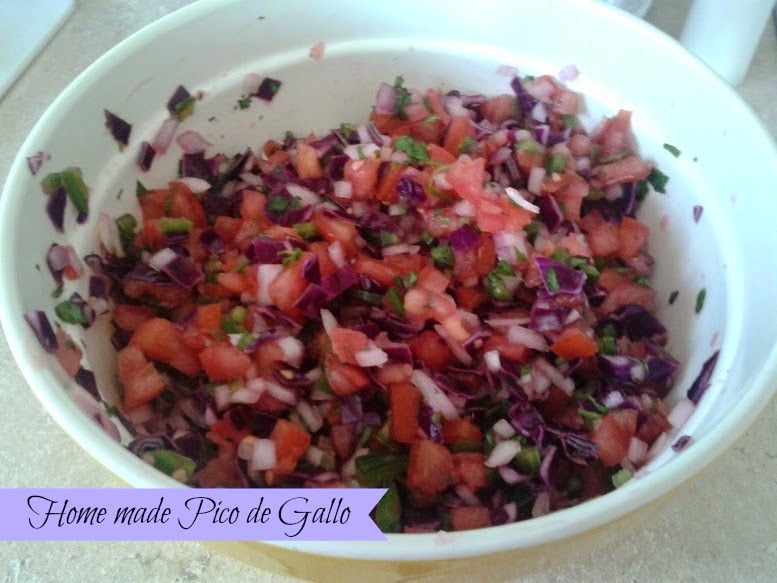 I’ve never been the biggest fan of Pico De Gallo but a few weeks ago my sister in law brought it over for a BBQ we were having. I refused to eat it, saying I don’t like it, while everyone around me was shoveling it in because they all loved it. So later that night after everyone was gone and I was sitting around looking for something to snack on, I decided to give it a try and it was amazing! I couldn’t stop eating it and I understood why no one else could stop earlier that evening. After asking for the recipe and not getting it, (I think she doesn’t want to share it 😉 ) I finally decided to make my own. 6 “on the vine” tomatoes- firm. I took all of the seeds out of the tomatoes. Just chop everything and mix it together, salting to taste. Refrigerate before serving. It didn’t taste any different than the one we had before- It was delicious! I was pretty proud of myself. The biggest part of this is chopping everything. It probably took about 1 1/2 hours to chop everything- Maybe I’m just slow? But it was totally worth the wait!